Carte de L'Oceanie dressee ET dessinee sous laDirection de Mr. J. G. Barbie du Bocage. 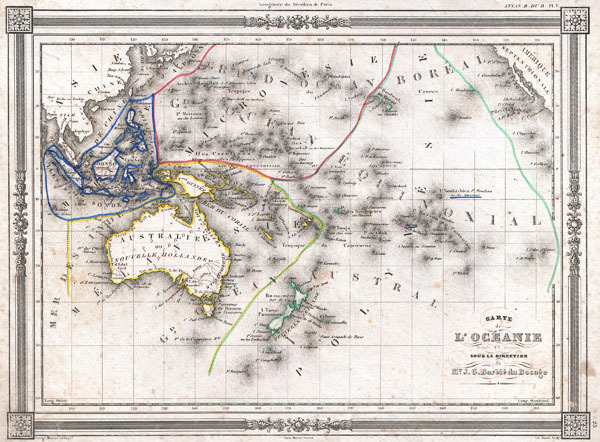 An uncommon and extremely attractive 1852 map of Oceania by J. G. Barbie du Bocage. Includes Australia, New Zealand, Polynesia, Micronesia, Melanesia and Malaysia. Australia is described as 'pays inconnu' and alternately labeled 'New Holland.' Hawaii shown as the 'Sandwich Islands.' Features a beautiful frame style border. Prepared by J. G. Barbie du Bocage for publication as plate no. 25 in Maison Basset's 1852 edition of the Atlas Illustre. Very good condition. Some foxing, else clean. Blank on verso.